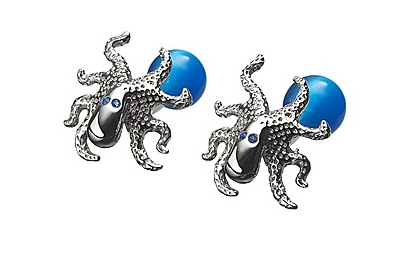 Be the party conversation starter with these Silver Octopus cufflinks from Tateossian of London. Bejeweled Eyes and solid metal casting, these fasteners are just the right amount of fun at your next event. Wit does not have to be funny, just clever enough to encourage a smile. Get them online here. This entry was posted in Accessories, Cufflinks and tagged Bejeweled Eyes, Silver Octopus, Tateossian London. Bookmark the permalink.